Historics Spring saw an array of British classics feature strongly amidst an exotic spread of intriguing cars and automobilia at Brooklands, on Wednesday 18th May, generating total car sales in excess of £670,000 and an overall sale ratio of 55% for cars and an impressive 92% for automobilia. It was fitting that a number of British marques took centre stage at the birthplace of British motorsport, with Rolls-Royce, Bentley, Jaguar, Jensen, Healey as well as Rover, all well represented amidst numerous entries from European manufacturers Ferrari, Alfa Romeo, Mercedes-Benz and Porsche. A resplendent green 1928 Rolls-Royce Phantom I Boat Tail Tourer by Brampton Brothers, sporting a somewhat eccentric yet elegant body style, sold for £48,000, while an equally eye-catching yellow 1930 Rolls-Royce Phantom II Three Position Open Tourer, witnessed a lengthy bidding war that ultimately ended with the hammer hitting £25,000. 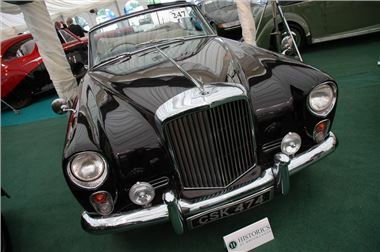 With seven Bentleys available to bid on, a beautifully presented 1960 S2 Continental by Park Ward – one of just 63 right-hand-drive drophead coupé examples - proved popular amongst bidders undaunted by its imposing appearance, fetching £46,000. In its centenary year, the Jaguar E-Type continues to attract interest, and a 1969 Series II Roadster sold for £24,000, whilst an elegant 1958 Jaguar XK150 Fixedhead Coupé – experiencing its own increase in interest – was closed at £36,500. Meanwhile a recreation by RAM of the famed D-Type, in the equally renowned Briggs Cunningham colours, changed hands for £30,000. Developing something of a reputation for the sale of fine classic commercial vehicles, Historics was able to offer one of just four 1951 Austin A70 Hereford Pickup’s known to still exist, and the plush ‘workhorse’ didn’t disappoint as it was sold for £17,500, comfortably over its estimate. Also exceeding expectations was a 1965 Rover P5 Coupé, which having travelled just 3,000 miles since a sympathetic restoration in 1985, was reflected in the final sale price of £11,500. Despite an eleventh-hour entry of a 575 Maranello once owned by legendary guitarist Eric Clapton to a line-up of ten other Ferraris, it was a 1961 250GTE that led the way for the iconic Italian marque, selling via the online auction service i-bidder for £85,500. Italy was also well represented by a fine quintet of Alfa Romeos, and a rare 1964 right-hand-drive (one of 102 from that year) 2600 Spyder fetched £35,800, while a diminutive 1969 Giulia 1300 TI, fresh from a tour during the official Alfa Romeo centenary celebrations in 2010, sold for £6,300. Two Porsches, a 1959 356A Coupé to Fast Road Specification and a 1961 356B T5 Super Sunroof Coupé, displayed in the sale room alongside one another, sold for £28,000 and £23,500 respectively. Historics Summer sale takes place at Brooklands on Tuesday July 19th and will feature a number of classic bikes alongside the usual array of fine cars and automobilia. For more information, and to consign vehicles to or attend the Historics at Brooklands Summer sale on the afternoon of Tuesday July 19th call 0800 988 3838, e-mail: auctions@historics.co.uk, or see the website, www.historics.co.uk.